To understand the INFJ, first we’ll have to understand their four main functions. The first primary function of an INFJ is Introverted Intuition or Ni. This is basically their internal way of seeing the world. It can be hard to explain to others, but it is essentially an internal sense of where they believe plans are going, or certain reactions that they expect in situations. It can be a bit mystical to others. It can sometimes predict the future very accurately but sometimes the INFJ can have trouble explaining their reasoning to other people. The INFJs second function is Extraverted Feeling or Fe. This is their external way of primarily dealing with the world. 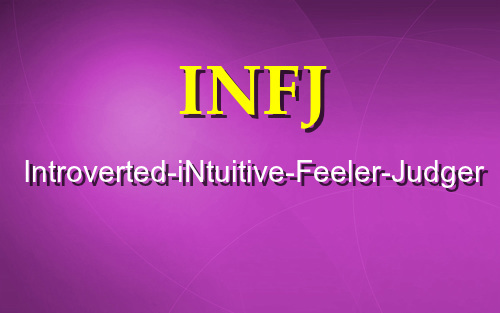 The INFJ is very good at understanding other people’s feelings, motives, and just where others are coming from. They are very good at empathizing with other people and understanding other people. They may also be able to sense others emotions before that person does and react accordingly. The INFJs use this Extraverted Feeling and with their Introverted Intuition to help shape their world views. Something that is developed a little bit later on in the INFJs life is their Introverted Thinking or Ti. This is more of an internal logical framework about how things work and how the world works in it. This function works together with Ni to form their inner structure of how they see and interpret things. Ti is almost like a blueprint that they learn and develop later on in their life. It can be useful in separating the personal emotions from a situation and making a more logical analysis of the event. Their fourth function is Extraverted Sensing or Se. This one is developed a lot later in life and never really becomes a dominate function because it goes against their first function of Introverted Intuition. Extraverted Sensing involves interpreting situations in the moment and being present and aware of your surroundings. This a bit of a weaker function so it could come out during stress. If they are in a bad situation, they become more impulsive and louder than they normally act. A strength of a INFJ is that they are very warm and self-sacrificing. They will bend over backwards for somebody that they care about or somebody that they’re close to. They have a very warm personality that is very caring. In a serious relationship they will give 110% to that person and make sure that those that they care about feel great. They have a strong desire to take care of them. INFJs are also very serious about their responsibilities. They are determined to complete whatever they see as their duty or feel obligated about. They are very serious about taking care of those matters. INFJs want to make an impact on the world in some way. This can lead them to have high expectations over themselves as well as others. They tend to want to push themselves and set the bar a little bit higher and work really hard towards achieving those goals. INFJs are also great listeners. They’re really great at empathizing and understanding other people. They’re good at taking a back seat to talking and just absorbing what the other person has to say and really understanding them. As with any type, while all types have their strengths, they also can have weaknesses that can come out from time to time. A weakness of the INFJ could be that they hide their feelings from the world. They are great at empathizing with other people but sometimes their desire to keep the peace can stop them from speaking up and saying what they are feeling internally. Ignoring their own feeling for too long can lead to stress. INFJs could also have trouble managing their money and their expenses. By nature they want to help other people, and that could be through buying a gift for a friend or possibly helping others out financially. This could cause them to sometimes spend their money in a way that can cause some problems in the future. An INFJ with balanced Introverted Thinking may become better with this in the future. INFJs also have a high dislike of conflict. By nature INFJs are very in tune with others emotions and they want to keep the peace. So causing a conflict in a relationship can be a problem at times and it could be an issue where their feelings get in the way of wanting to say what they truly mean. INFJs may also have difficulties ending troubled relationships. They could get into relationships where they feel that they can fix the other person and begin to see that as their duty. This could cause them to get the short side of the stick, so to speak. They may be internally torn between wanting to help the person but feel that the relationship is not helping them to move in the right direction. When an INFJ is under stress, this can cause some problems. One problem is that they may become impulsive and ignore their inner self. They might act on impulse and just live in the moment. This is from them over indulging in their Extraverted Sensing mentioned earlier. Se could allow the INFJ to stand their ground and defend themselves, however, living in the moment could also cause them ignore their inner self and what they believe themselves to be. This can possibly make them behave in a way that is completely against how they feel they want to be as person. INFJs under stress also have a tendency to leave a bad situation and cut all ties. They might just quit a job or completely leave a situation or relationship, or possibly move somewhere new to escape their bad feelings. They could have a fight or flight response in these situations. It is important for the INFJ to recognize that their feelings will pass and the situation can be fixed. The INFJ can also become very picky and fault finding. This can form almost as a defense mechanism. They have an internal vision that they want to see develop. And if they’re in a situation where no one else really has a vision or wants things to change, it can really make them frustrated and want to speak out against that. Check out 13 Signs You Are An INFJ!